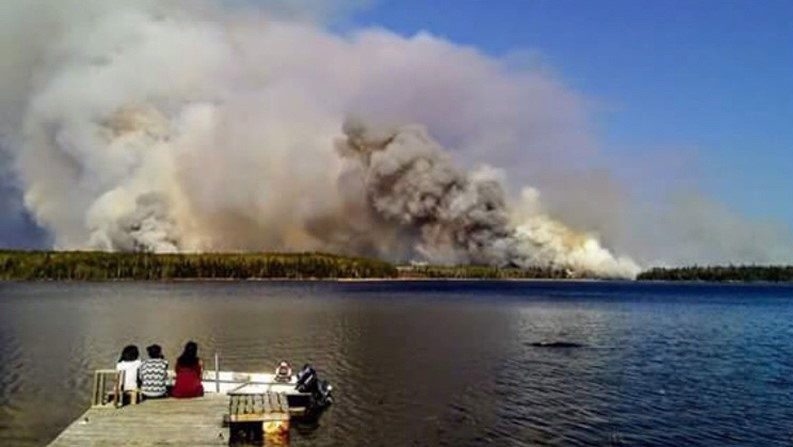 WINNIPEG -- The federal government said it is stepping up efforts to evacuate two Manitoba First Nations that are threatened by a raging wildfire. Public Safety Canada said about 600 people were expected to be evacuated from the Little Grand Rapids and Pauingassi First Nations by the end of the day Wednesday with more to follow. "Evacuations can continue into the evening as additional lights have been set up at the community airport," the department said in a release. "Evacuations will continue into the evening and tomorrow." The Canadian Red Cross estimates about 1,400 people will be forced from their homes about 260 kilometres northeast of Winnipeg. Federal officials said the fire conditions early Wednesday evening indicated the wind was blowing the flames away from the communities. Crews were deployed to fight any fires that break out on the reserves. Leaders from Little Grand Rapids First Nation are furious, saying the federal and provincial governments hindered their efforts to evacuate their fly-in community earlier in the week. About 630 people were huddled, many with blankets covering their faces, in a smoky gymnasium at the school in Little Grand Rapids, the leaders said. "It's very frustrating, and in the back of your mind when you think about it, it could have been prevented. Measures could have been taken," said Little Grand Rapids Coun. Clinton Keeper. The fire started on Monday and was caused by person, said a statement from Manitoba Sustainable Development. It was small and fire crews thought it could be contained, but as the winds picked up it grew to about 50 square kilometres. By Wednesday it was 200 square kilometres. The chief and council said they contacted Indigenous Services Canada on Monday requesting help with an evacuation. Keeper said the federal government sought guidance from Sustainable Development, which relayed the message that the fire was under control. However, Sustainable Development said staff attempted to contact the chief and council but couldn't reach them. As the flames crept closer and the sky filled with smoke, the chief and council said they reached out to the federal government for help again on Tuesday. It wasn't until ashes started falling on the community that action was taken in the evening, the First Nation leaders said. "People were so happy to get out. They were told to go to the airport. They went to the airport and next thing you know they were told to wait," Keeper said. The blaze had burned too close to the airport and the thick smoke kept the planes from landing. Only 63 people were able to be removed. The rest were taken back to the school, which was being protected by sprinklers. The province "knew ... that it was dry, that the fire was going to spread, that it was going to get bigger, but it got worse," said Keeper. "They are luckily there's nobody that died in there so far. There's been quite a few houses that burnt and luckily there's nobody in there." Initial reports said 11 houses were destroyed. Communities make their own decisions about evacuation with input and consultation from agencies like Sustainable Development, the provincial department said in a statement. In this case, the chief announced the evacuation without any consultation with the province, the statement said. Indigenous Services Canada is monitoring the situation closely, said spokeswoman Martine Stevens, and regional staff have met with the chief and council. Grand Chief Jerry Daniels of the Southern Chiefs Organization said the delayed response shows that First Nations need to oversee emergency services and responses for their own communities. "We shouldn't be asking for help on these things. We should be given the proper resources to help ourselves," he said. Amik Aviation, which provides transportation to northern communities in Manitoba, cancelled all of it's regularly scheduled flights to help Wednesday. Manager Terrence Owen said the company used float planes to land on the water and then transport people by boat to the plane. "It's pretty bad. I can see it on everyone's faces," he said. "No one has seen a fire like this before." A CH-147 Chinook helicopter was to fly about 90 people out of Little Grand Rapids Wednesday, said David Lavalee, a Royal Canadian Air Force spokesman. About 160 people had been evacuated by Wednesday afternoon, band officials said. "Efforts are underway to continue evacuations as quickly as possible," Public Safety Canada said in a release. Crews from Manitoba and Ontario are fighting the wildfire along with water bombers from Quebec.